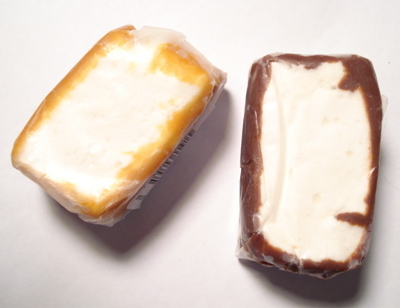 Individually wrapped in waxed paper, the rectangular marshmallows have a chunky, rustic look, bearing borders of vanilla and chocolate-flavored caramel respectively. They have the appearance of having been cut from a big log of caramel-coated marshmallow (and if you can think of a stickier, messier job than coating a log of gooey marshmallow in hot, sticky caramel, Iâ€™d like to hear it). The ingredient list is pretty simple, but not as simple as youâ€™d expect from something bearing the name â€œall naturalâ€ (which, admittedly, doesnâ€™t mean an awful lot these days). Are coconut oil, corn syrup, and invert sugar â€œnaturalâ€ products? For that matter, is gelatin? Regular sugar? Who knows? Vanilla: The caramel tastes like cream and sugar, just like itâ€™s supposed to. Itâ€™s also got a little molasses edge, though thereâ€™s none listed on the ingredients. It reminds me a little of that Halloween molasses toffee in the orange wrappers. Chocolate: This was very stuck to the waxed paper â€“ I hope I didn’t eat too much paper with my marshmallow. It has a nice mild, slightly salty chocolate flavor that comes from chocolate liqueur, not cocoa. Itâ€™s a very different flavor and texture experience than the chocolate-covered marshmallows Iâ€™m used to â€“ chewy rather than snappy, with a flavor thatâ€™s closer to a Tootsie Roll than real chocolate. Itâ€™s not at all bad, just different. The marshmallow centers are firm and pillowy, a little dry on the outside, and quite chewy for marshmallow. Iâ€™m not sure if theyâ€™re supposed to be this dry or if mine have gotten stale already in the month since the All Candy Expo. This is definitely not a bad thing, though â€“ the denseness of both the caramel and the marshmallow were a really good textural combination. I liked how substantial they felt in my mouth. (I donâ€™t think Iâ€™m alone in this â€“ just look at how many people wonâ€™t eat Peeps unless theyâ€™re good and stale.) They have a nice long chew for marshmallows, without being too heavy or sweet like a pure caramel. In all these are definitely a tasty treat, and Iâ€™m really wishing Iâ€™d grabbed more than the couple of samples. If youâ€™re a marshmallow (or caramel) junkie like me, you really owe it to yourself to give them a try. Oh man do these bring back memories. i tell everyone the story of the candy counter at our local Sears store where they made something exactly like these. i was totally addicted them as a kid. I need these NOW! I’m so bummed I missed these at the All Candy Expo! Luckily, I’m going to redeem myself at the Fancy Food Show this weekend and find them. Yum!